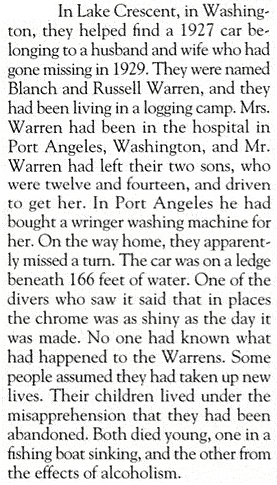 There is an excellent article in the latest Harper's by Alec Wilkinson, a veteran staff writer at The New Yorker, describing the work of a husband and wife team who spend nearly two hundred days a year travelling America with a boat to search for the drowned. This is Wilkinson's first piece published with Harper's, and I like very much that the brief biographical note appended to the article does not mention The New Yorker. One of these days I will write a long essay here about Harper's and The New Yorker, explaining why Harper's is clearly superior, flawed though it is by the omnipresence of Lewis Lapham's imperious ego. B. adj. (attrib.). Found in or characteristic of the magazine The New Yorker (founded 1925), noted for its urbane and sharply observed view of American life. 1934 Fortune Aug. 75/1 No advertising man is believed, by the editors, ever to have understood a New Yorker joke. 1948 Hearst's Internat. May 175/1 Literary critics and editors of other magazines are always referring to ‘The New Yorker style of writing'. 1959 Times Lit. Suppl. 2 Jan. 4/2 He surveys the established Old Guard.., the new ‘realists’.., the New Yorker School. 1992 New Yorker 3 Feb. 65/1 (advt.) The design is distinguished and very New Yorker: Eustace Tilley-patterned endpapers.